Vancouver’s favourite outdoor ice rink will open once again this winter for skating and public events. 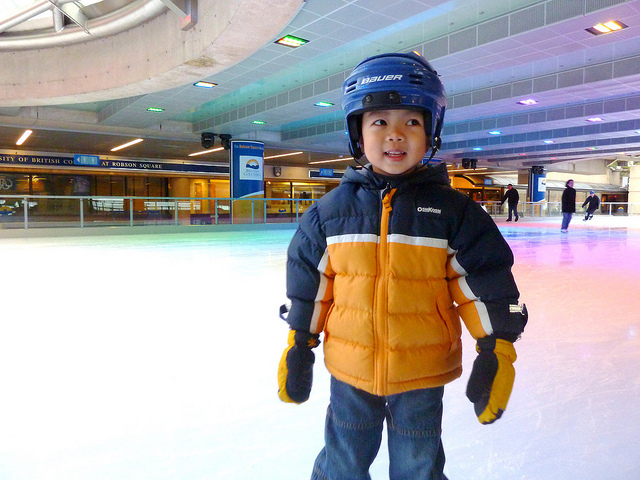 The skating rink at Robson Square will open daily from December 1, 2011 to the end of February 2012, weather permitting. Skating is free if you bring your own skates, otherwise rentals are available. A concession stand, with snacks and warm drinks, is also available at the rink. Sunday – Thursday: 9 a.m. – 9 p.m.
Friday – Saturday: 9 a.m. – 11 p.m. The 12 days of Christmas are a festive time of the year and nowhere will it be more publicly celebrated than at Robson Square. There will be carollers, live music and entertainment every evening from 6 p.m. to 9 p.m. On Christmas Eve, free hot chocolate will be handed out from 5 p.m. to closing at 9 p.m. The skating rink will be open for people to enjoy from 12 noon to 5 p.m.
Once again, the Province will host a family friendly 2012 New Year’s celebration. New Year’s Eve will be a magical evening with live music, stilt walkers, sorcerers, witches and a magician’s stage show. There will be free glow sticks and noisemakers for kids as we countdown to an early New Year at 8 p.m.
On Sunday, January 1, 2012, the rink will be open regular hours for skating, from 9 a.m. to 9 p.m. Located in the heart of downtown Vancouver, Robson Square is a provincial landmark that includes the Provincial Law Courts, UBC Robson Square, the Vancouver Art Gallery and the Asia Pacific Centre. The facility is the Province’s largest building with 1.2 million square feet extending over three city blocks. The internationally recognized facility was designed by renowned architect Arthur Erickson. The Province received international kudos during the 2010 Olympic and Paralympic Winter Games for the use of the space – for the international media centre, as a gathering place for business leaders and for the thousands of people who enjoyed the ice rink, zip line, free entertainment and concerts. From 2004 to 2011, the Province worked to revitalize and extend the life of Robson Square. The complex had begun showing signs of aging and required exterior renewal. The Robson Square Renewal Project was a $41 million, multi-year project to ensure the vibrancy of the landmark space continues well into the future.